When MamaSue shared that she would like to host a food blogtrain and looking for eager participants, I agreed to join it without much thoughts. 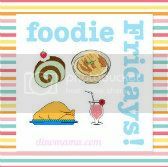 Besides having a chance to join in the fun and cooking some delicious food for the family, what excites me is the 3 different cuisines themes she had listed out; Peranakan, Dialect & Japanese. My dialect is Hakka or Kheh, I've been wanting to cook more Hakka dishes and this is another chance for me to link up and show others my unique dialect dish. I've never done Peranakan or Japanese dishes before so this will be my first time doing it, definitely a challenge for me. I even borrowed a Peranakan recipe book from the library to find out more about Peranakan dishes. 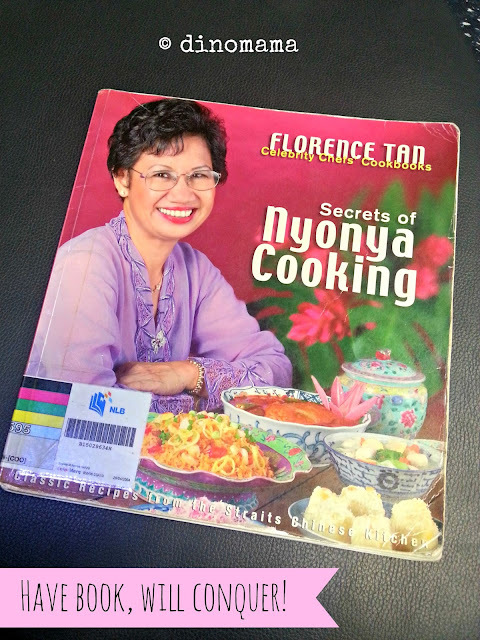 Its either I am not looking the right way or there are really very limited Pernankan recipe books in the library, in this case, I only found ONE; Florene Tan's Secrets of Nyonya Cooking. Regardless, one is better then none, so this book went home with me that day. We went to Sheng Siong Supermarket that morning to gather all the necessary ingredients, DinoPapa was really happy to be able to get a fresh red snapper fish head and also some of the lesser seen spices. 3. Stir-fried paste with thin coconut milk, torch ginger bud, kaffir lime leaves and tamarind juice. 4. In goes the vegetables. 5. Lastly the fish head goes in. 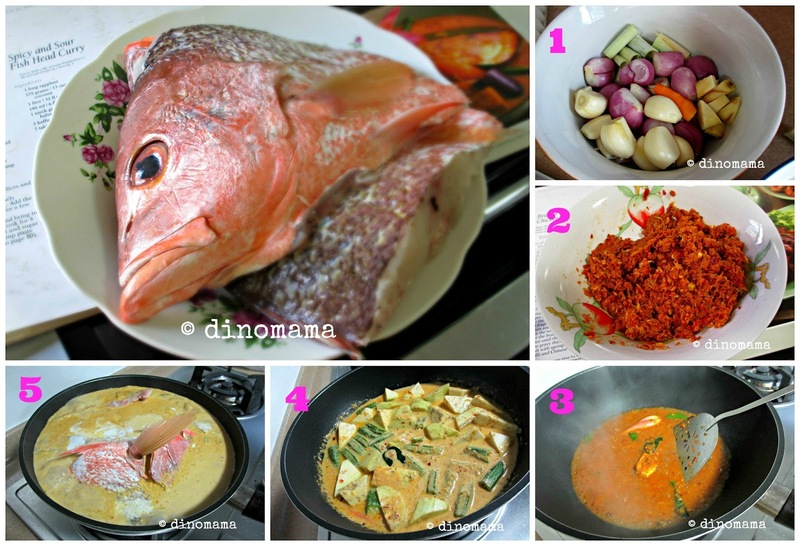 Our fish head curry is not as red as you usually see as DinoPapa did not put a lot of chillies and the tamarind since DinoAuntie does not take too spicy food, we also want the kids to take a little bit of the fish thus our fish head curry is only mild spicy. I'm sure you can make yours into the beautiful bright orange color with the right spicy sourish gravy. Oh, did I mention that we had a Peranakan feast? DinoPapa whipped up this Spicy and Sour Fish head curry together with Deep-fried Sour Prawns, Stir-fried Curried Clams and Stir-fried Chicken with Preserved Soy Bean Paste, I'll be sharing the recipes in the next 3 Foodie Fridays linky party posts. 1. Cut eggplant into 2.5cm lengths, halve each piece and make a slit through each piece from one end to the centre. Soak in water. 3. Add the remaining water to the grated coconut and squeeze 750ml thin coconut milk. Set aside the thin milk. 4. Heat the cooking oil and fry finely ground paste until fragrant. Gradually stir in the thin coconut milk. 5. Add torch ginger bud, kaffir lime leaves and tamarind juice. Bring to a boil, lower the heat and simmer for 7 mins. Add the eggplant. 6. Increase the heat, add the fish head, lady’s fingers, tomatoes, seasoning and thick coconut milk. When the fish head and vegetables are cooked, remove from heat. 7. Serve hot with rice or bread. Wow, an entire peranakan feast! I must thank PapaDino for being so enthusiastic ah! :p AHEM: did you also share with him that you are participating in the Oct's and Nov's train too??? arh??? eh I did not tell him abt the dialect theme, perhaps I should then he shall contribute to it hahaha~ Jap... I dun think he knows, maybe will be like me, do research in the library. My husband and I love this type of food, although I've never eaten a fish head. I would love to know how to go about it. If there are only two heads in the dish and five people, how do you divide it? Hi Francene, for such a dish you will only need one fish head; either a red snapper or garoupa. We usually have this together with some other dishes like stir fried vegetable or some meat. So there will be enough fish meat for 4-5 pple's share, don't forget to eat the vegetables in the curry too. Hmmm, I don't think I could get over the fact that there is fish heads in there! I may have to use a substitute! I love curries though. You can use fish fillet as a substitute. I have tried fish curry... but using the filleted fish. I love fish heads and I think I will try this one... although I will just use store bought curry mix. Store bought paste should be good too. We love to make our own paste so we can decide on the spiciness of the dish.